I love this game! It takes me back to the day…you know when you used to make a million dots on a piece of paper! When you open the app, it will bring you directly to the main play screen. On the main play screen, you will notice the title of the two players at the bottom of the screen and an “i” icon. If you select the information icon you will get the option to change the title of the players, start a new game and learn more about the application. To get back to the main menu, select Done in the upper right corner. Now, you are ready to play. 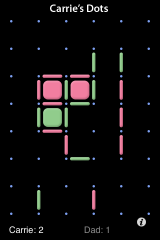 The object of the game is to build more boxes than the other player. 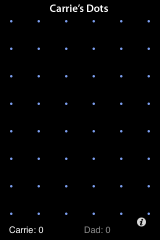 You create boxes by making lines from one dot to another. 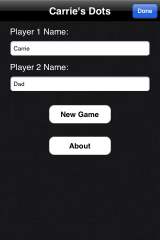 The first player will make the first line between any two dots that they would like. It is then the second players turn to create a line any where they would like. Each person continues to add a line until boxes can be formed. You can create a box once there are three lines outlining a box and you can add the forth line to complete the box. So, you basically do not want to add the third line to a box because then the next player can add the forth line and finish the box. Also, if you finish a box, you get another turn. So, if it works out right, you could create a bunch of boxes in a row. 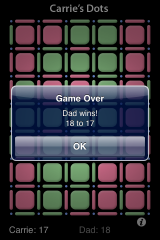 Once all the boxes are complete and the game is over, you will get pop-up displaying the score. In order to start a new game you need to go into the information option and then select New Game. I like this application because it is fun to have a few two player apps on your iPhone and because it has a decent interface. 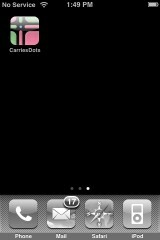 Click here to download CarriesDots via the App Store. Never mind about it not showing in cydia its not in there yet give it some time to be ported in, and don’t ssh the app it crashes even with correct permission. 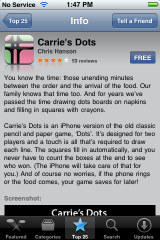 This is a copy of the game “dot game” also available in the app store for free, but instead of just having two colors you can choose pictures from your camera roll, photo album or from a list of default icons. You can also change difficulty, or verse another person, it also keeps score and says who’s turn it is. Why both games are not avaible in the brazilian store?